I made this quick cucumber side dish the other day. I found the recipe on Pinterest and modified it slightly. Cucumbers are full of anti-inflammatory Vitamin K but make sure they are organic!!! Cucumber is on The Dirty Dozen List,(I wrote aboutit HERE) meaning they have fairly high levels of pesticides and insecticides, which are toxic to the nervous system. 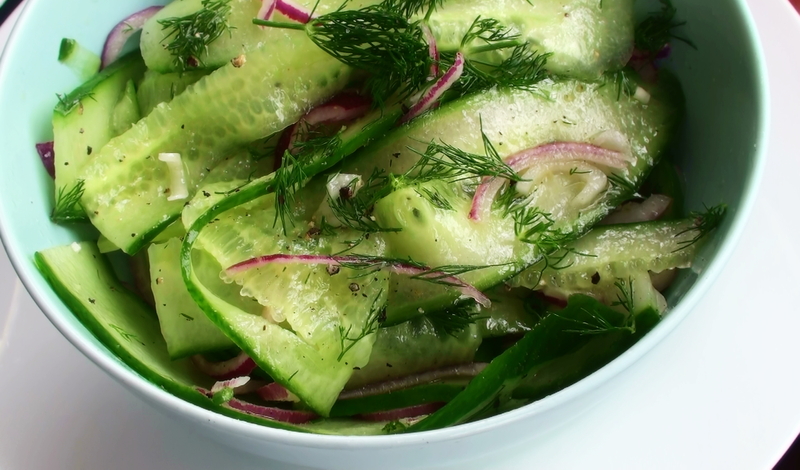 This salad also contains the Scandi-Classic herb dill. Almost all traditional dishes in Sweden are served with or cooked in dill, which is not a bad thing, dill is super good if you suffer from gas and bad breath and it’s excellent for breastfeeding Mum’s as it increase milk production. 1 Cucumber, thinly sliced. ( I used a cheese slicer). 1 Red onion, also thinly sliced. 1/2 cup of chopped dill.